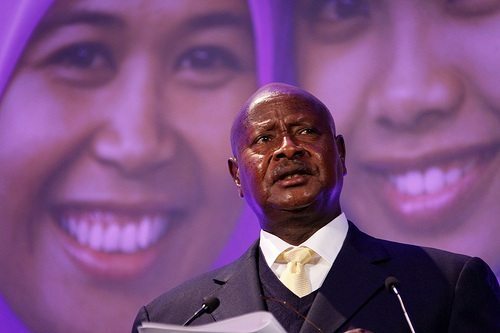 Ugandan President Makes Large Donation In Cash: Business As Usual? Our occasional coverage of Invisible Children’s efforts to get warlord Joseph Kony out of Uganda (where he and his Lord’s Resistance Army haven’t played a noteworthy role in a long time, as they appear to be on the run largely in the Sudan or South Sudan) and in front of the International Criminal Court in the Hague has meant that we have occasionally taken note of Uganda’s government under Yoweri Museveni, president of the nation since 1986. There was some well-publicized controversy concerning Uganda’s repeatedly introduced legislation that would make homosexuality, already prohibited in the nation, a crime that, if deemed to be “aggravated homosexuality,” whatever that might be, would be punishable by death. Invisible Children, which has some Christian fundamentalist funding relationships, took pains after criticism to dissociate itself from the law, and President Museveni, while declaring himself opposed to “promoting” homosexuality, came out against the death penalty as a possible punishment. Nonetheless, beyond the Kony campaign and the homosexuality legislation (introduced by a member of the Ugandan parliament, not initiated by the Museveni government, as regime spokespeople repeatedly note), what do we know about Uganda and charity, especially since a significant portion of the fundraising by Invisible Children is targeted, according to them, to charitable activities in Uganda, particularly geared to the many orphans and refugee that Kony created in the heyday of his murderous tour? Critics such as Jackie Asiimwe-Mwesige, whom the Associated Press describes as an anti-corruption activist, asked, “Which president walks around with kilograms of money? It looks so pedestrian. It doesn’t augur well for his stature.” Others, such as researcher Peter Magelah from the Acode think tank, questioned the potential lack of accountability of the donation, but Tumwebaze defended it, pointing out that the donation was made in public, fully visible, so that the Ugandan citizenry would know who received it, as opposed to doing it in secret or simply having President Museveni walk off with the money.